Review by AllTheBestFights.com: 2016-12-30, great performance by both fighters: Dominick Cruz vs Cody Garbrandt gets three stars (UFC Fight of the Night). The Ufc Bw champion Dominick Cruz entered this fight with a pro mma record of 22-1-0 (36% finishing rate) and he is ranked as the No.1 bantamweight in the world. He suffered his only loss when he faced Urijah Faber in 2007, since then he has won 13 consecutive bouts taking revenge on Faber in 2011 (=Cruz vs Faber 2) and in 2016 (=Cruz vs Faber 3); Cruz has also beat TJ Dillashaw in 2016 (=Dillashaw vs Cruz). His opponent, the undefeated Cody Garbrandt, has a perfect record of 10-0-0 (90% ko/tko victory rate) and he entered as the No.9 in the same weight class. He has already fought three times in 2016 winning over Augusto Mendes (=Garbrandt vs Mendes), Thomas Almeida (=Almeida vs Garbrandt) and Takeya Mizugaki (=Garbrandt vs Mizugaki). 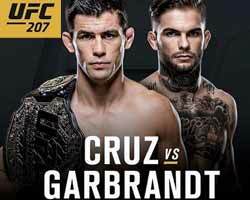 Cruz vs Garbrandt is valid for the Ufc bantamweight title (Cruz’s second defense); undercard of Amanda Nunes vs Ronda Rousey – UFC 207. Watch the video and rate this fight!